There is a certain joy to be had in the little things. Luckily, we found countless of them at Charminar’s Sunday market. 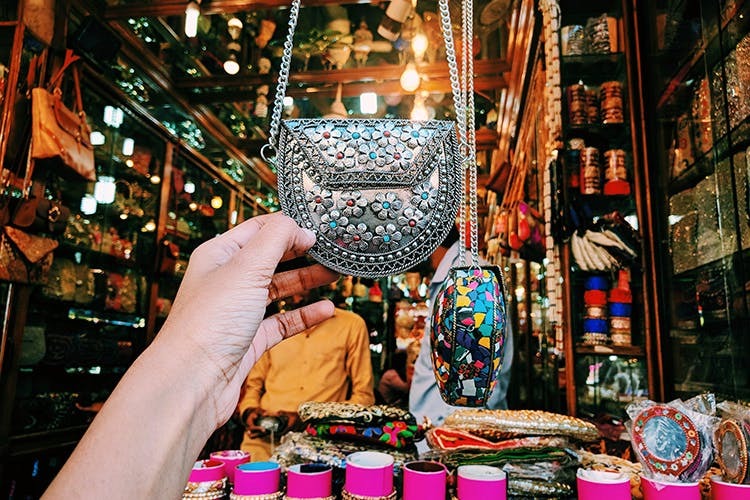 The bustling market and the hustling crowd will create havoc on all your five senses — the aroma of kebabs and Irani chai, the glitter of lovely glass bangles and all things glimmer will bring out that budget shopaholic in you. Old City, laidback in its own way, bestirs itself a little late in the noon for the Sunday market that usually runs till the wee hours of the midnight. Pearls, dainty crockery, fresh flowers, and the most unconventional items you’d be surprised to find are sold on Sundays. We recommend you start your day with a hearty breakfast and walk the lanes of the Old City to discover a heritage that it holds close to its heart. And if you’re interested in some budget shopping, right from jewellery to kitschy sling bags, here’s a list you must absolutely pick. The best part? They are all priced under INR 500. Nostalgia collectors, rejoice! If old coins are your thing, then you should make a quick visit to Ghansi Bazaar on Sundays. Spread on the footpath between Mecca Masjid and Charminar, the collection of coins on pavement stalls will stump you. There’s Indian annas, old rupee coins, and many other vintage ones that we haven’t seen before are put on a humble display — all we can say is, take your pick. The first thing that pops into one’s head when spoken about Charminar is Laad Bazaar. The moment you step into the bazaar, you’ll be surrounded by pushcarts, large stores, and road-side baskets heaped with bangles of various designs and colours. Starting at a price of INR 30(if you’re a pro at bargaining, the price might go down) and rising upto INR 1,000 depending on the type, you’ll find bangles that aren’t found anywhere else here. Girls, if you have been eyeing those suede pyjamas on international websites that refuse to deliver to Hyderabad, then let’s tick this concern off the list. Because right under the hood of Charminar, street vendors have a collection of them. Done in plain colours and floral prints, these PJs are bundles of joy. We think this calls for a Pyjama Party! We found ornate metal sling bags with floral carvings here. These kitschy bags are perfect to carry with your ethnic wear or even for a night out. Found in most of the stores at Laad Bazaar, they are priced at INR 450. However, bargain your way. While you cannot carry your whole world in them, they’re perfect for holding your phone, cash/cards. If the body mists by Forest Essentials are your thing, then you’re going to enjoy the fragrance of Hyderbadi attar. The fruity ones might be a tad bit strong, but the floral or the sandalwood ones can be quite refreshing. Do sample various flavours and pick the ones that have floral undertones. We discovered a delicious spread of them right outside the entrance to Mecca Masjid. The owner sits with a sweet sweep of attars, surma (powdered kohl), and several natural products for hair and skin care. The alleys of Laad Bazaar are a treasure trove for the ones with the knack of spotting offbeat or bohemian jewellery. We found beautiful maang tikkas done in white stones, red stones, pearls… you get the drift! These beauties can make all the difference to your ethnic outfits. While you’re at it, make sure to pick a Boho statement neckpiece too. Stock up on juttis and shimmery wedges for as low as INR 100 to 200. Really these are a steal! The footwear sold at Charminar are specifically made either for casual wear or weddings, often to complement ethnic wear. The goodness of the juttis is that they are found in boundless colours that match lehengas and sarees. But yes, we cannot vouch for the quality.